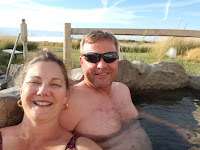 THE ROMANY LIFE: Hot Soaking At Summer Lake Hot Springs! Well, this is a first for us. We have never been to a hot springs before. Weird, I know, since we live in the Pacific Northwest which is very volcanic... there are tons of hot springs all over and we have never been. 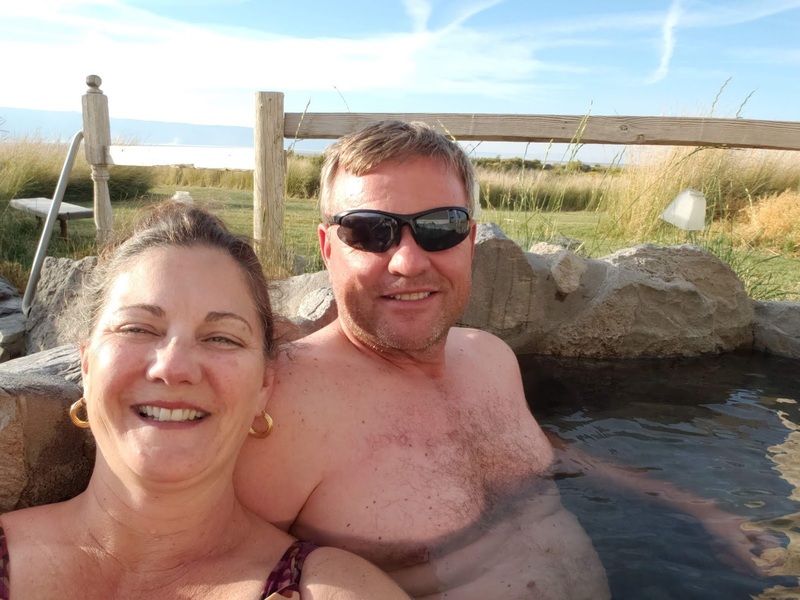 This hot springs is located in a very lonely stretch of highway in Southern Oregon. We pulled in and were checked in by an extremely friendly, extremely tan woman who obviously worked outdoors a lot. She gave us a quick run down on the place, and told us the rules, "we don't have any rules". But they do have rules posted at the hot springs pools, which basically are; don't make noise and splash about and shower before you enter-oh, and clothing optional after 9 PM. Ok... NOTED. The main pool is located inside of this little building. We got settled in; we were surprised that this very-shall we say rustic-place offered full hookups. It was quite windy so there wasn't much to do. As soon as we could we got our bathing suits on and headed for the pools. You know how much I love hot water. Why in the WORLD haven't I gone to visit hot springs? GOOD LORD they are amazing! Obviously, we are changing our travel itinerary to include more of them on this years snowbird trip. We soaked first in the large rectangle concrete pool in the metal shed. The water was very warm, and nearly too hot to stand coming from the pipe in the wall where the hot springs entered. Naturally I parked my tired shoulders directly under the pipe and the aromatic water worked miracles. Yes, it is a strong sulfur smell, but you actually learn to love it, it just feels so wonderful and so healing. There were dressing rooms surrounding the pool and a shower to use before entering. Our full-hookup spot just a short walk from the hot springs. We had a nice dinner and returned later to enjoy the hot springs again. Then in the morning we took one more dip in the outside rock pools that are just behind the metal shed. They are small, more private pools, and each has it's own spring water pipe running into it. PURE HEAVEN. Oh what I have been missing all of my life! I know you guys have been to hot springs, and you TOLD me how yummy they are. I should have listened.